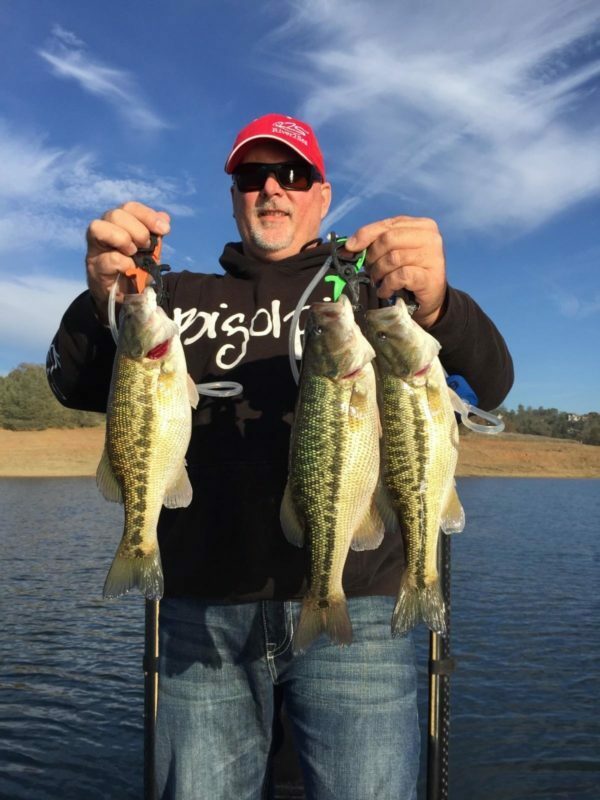 My buddy Matt Farley and I headed out to Folsom Lake to have a fun day of fishing. We started first thing in the morning at safe light and it was freezing cold with a 10MPH North wind blowing down the lake and at the ramp. Our first move was to run up the South Fork to an area I have been seeing a lot of baitfish in prior weeks. When we arrived, a fog was covering the water and luckily the spot was out of the cold wind. We immediately noticed a lot of top water activity. I figured it didn’t make much since for the Bass to be on the surface busting shad in winter conditions, but we decided to check it out anyway. We saw a seagull dive down and grab a wounded shad from the surface, so we knew some feeding activity was going on. In the area bait was balled up all over my graph so I chucked a blade bait around the area and no luck. Matt fished the bottom to about 30 feet where we could clearly see fish on the graph and no luck there neither. I saw a fish jump and chucked my Blade bait. My Rod loaded up on a fish and the fish turned out to be a small Rainbow Trout. The back of the cove was full of Trout feeding on the shad. Since they weren’t our target species, we left the area and headed back out to the main lake guessing that we would find some feeding fish on shallow rocks since it was still early. Creeping my Canopy Grenades Football Jig around the rocks I loaded up on my first Bass of the day. A Solid 6.5LB Spotted Bass. She popped it once on a hop and dropped it, I let it sit, hopped it again and she nailed it. Once we got her in I casted back into the same spot she was, the rod loaded up again on the fall, checked it and set, Line Broke! Sadly, I could feel that that fish was huge by how it took off when I checked it. Oh well. We continued to follow the jig pattern till around 3:00 pm and continued to boat keepers in the 1.75-3lbs range. Darter head trick worms was our other method that worked. One thing we found was if you didn’t stay on or near the bottom you weren’t getting bit! If you head out there and you are after Trout there is no shortage in the south arm. If you are targeting bass make sure you bring a lot of jigs, darter heads and shaky heads. We found our better fish in areas where you will have to be ready to get stuck in a rock almost every cast. Use as light a line as you feel comfortable and be patient the fish are there! Good luck and I’ll see you on the water! Last note: If you want a high-quality hand tied Jig. You should check out Canopy Grenades. Ultra-sharp Mustad hooks, great strand count and extremely durable paint finish (believe me I’ve put this to the test!) Want a custom color? They do that to!